The early history of Islam properly begins with Muhammad, an Arabian religious and political leader, who Muslims believe to be the last prophet of Allah (God). In Islamic historiography it is stated that Muhammad is a descendent of Ishmael, a son of Abraham. (And when Abraham and Ishmael were raising the foundations of the House [Abraham prayed]: “Our Lord! Accept from us; surely You are the Hearing, the Knowing (2.127). Our Lord! Make us Muslims and raise from our offspring a nation of Muslims. Show us our ways of worship, and relent toward us. Surely, Your are the Relenting, the Merciful”) (2.128). When Muhammad was twenty five years old, he was hired by a woman called Khadija to take her merchandize to Syria. Khadija, a widow fifteen years Muhammad’s senior, later proposed marriage to him, which he agreed to. They lived together for almost a quarter of a century, until the death of Khadija about eight or nine years after the revelation of the Qur’an. It is interesting to note that Muhammad did not get married to any other woman during Khadija’s life, despite the fact that polygamy was common practice in that society. But after her death he took a number of wives. The exact number is not certain but it is believed that he had nine wives in all. Muhammad was deeply interested in matters beyond this mundane life. 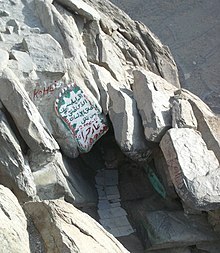 He used to frequent a cave that became known as “Hira‘” on the Mountain of “Noor” (light) for contemplation. The cave itself, which survived the times, gives a very vivid image of Muhammad’s spiritual inclinations. Resting on the top of one of the mountains north of Mecca, the cave is completely isolated from the rest of the world. In fact, it is not easy to find at all even if one knew it existed. Once inside the cave, it is a total isolation. Nothing can be seen other than the clear, beautiful sky above and the many surrounding mountains. Very little of this world can be seen or heard from inside the cave. The inhabitant of that cave was obviously interested in things beyond this world and its material riches. The Qur’an continued to be revealed in fragments to Prophet Muhammad over the following twenty two years. The last words of the Book were revealed to the Prophet shortly before his death in 632 CE. Was always a very close Companion of the Prophet, he knew him better than any other man. He knew how honest and upright the Prophet was. Such knowledge of the Prophet made Abu Bakr be the first man to follow the Message of Prophet Muhammad . He was indeed the first adult male to accept Islam. The Prophet told Abu Bakr what had happened at Hira Cave, he told him that Allah had revealed to him and made him His Messenger. When Abu Bakr heard this from the Prophet , he did not stop to think, he at once became a Muslim. He submitted to Islam with such determination that once the Prophet himself remarked, "I called people to Islam, everybody thought over it, at least for a while, but this was not the case with Abu Bakr, the moment I put Islam before him, he accepted it without any hesitation." He was titled as-Siddiq by the Prophet because his faith was too strong to be shaken by anything. In fact, Abu Bakr was more than a great believer, as soon as he became a Muslim, he immediately began to preach Islam to others. Among those who accepted Abu Bakr's invitation to Islam were 'Uthman, Az-Zubayr, Talhah, 'Abdur-Rahman ibn Awf, Sa'ad ibn Waqqas and others who later became component's of the prophet themselves. Abu Bakr's love of the Prophet was so great that he was willing to sacrifice his life for the sake of protecting and comforting the Prophet saw. Such love and sacrifice were demonstrated when one day the Prophet was saying his prayers in the Ka'bah, while some of the chiefs of Makkah were sitting in the court yard of the Ka'bah. Seeing the Prophet praying, 'Uqbah ibn Abi Mu'it took a long piece of cloth and put it around the Prophet's neck and twisted it hard in an attempt to strangle the Prophet to death. At that moment Abu Bakr happened to pass by from a distance, he saw 'Uqbah trying to strangle the Prophet to death. Immediately Abu Bakr ran to the help of the Prophet, he pushed 'Uqbah aside and took the cloth from around the Prophet's neck. Thereupon the enemies of Islam came down upon Abu Bakr and beat him unmercifully, although Abu Bakr with faith like a rock did not care for his own suffering, he was glad that he was able to save the Prophet of Allah, even at the risk of his own life. Abu Bakr with the wealth he had, also had a major role in freeing some of the Muslim slaves, who were barbarically tortured by their heartless masters to give up the faith and return to their masters' beliefs. The heartless monsters tried all kinds of torture: they made them lie all naked on the burning desert sand, putting big stones on their chest, as well as other kinds of torture. Here Abu Bakr's wealth came to the rescue, as he bought the poor helpless slaves from their inhuman masters and set them free, Bilal al-Habashi, the slave of 'Umayyah ibn Khalaf, was among those who were set free by Abu Bakr. 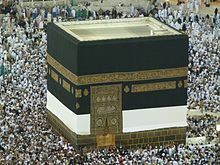 Bilal became afterwards the mu'adhin at the Prophet's mosque. Islam was growing rapidly in Makkah, the enemies of Islam were getting frustrated by this rapid growth. The chiefs of Makkah found that it is necessary for them to get rid of the Prophet before Islam can cause a real threat to them, so they planned to kill the Prophet. Allah revealed to his Prophet the intentions of the non-believers and ordered him to migrate to Madinah. So the Prophet quickly went to Abu Bakr's house who was among the few that were left in Makkah with the majority of Muslims having already migrated to Madinah. The Makkans were so eager to find the Prophet they were searching for him like mad hounds. Once they came to the mouth of the cave, Abu Bakr grew pale with fright, he feared not for himself, but for the life of the Prophet. However, the Prophet remained calm and said to Abu Bakr, "do not fear, certainly Allah is with us". Such words quickly calmed down Abu Bakr and brought back tranquility to his heart. Abu Bakr, being the closest of Companions to the Prophet, took part in all the battles that Prophet Muhammad had fought. The Prophet Mohammed appointed Abu Bakr as his agent to lead the Hajj in place of him in the ninth year of Hijra. The Prophet led the prayers himself ever since he arrived to Madinah. During his last illness, the Prophet could no longer lead the prayers, he was too weak to go to the mosque, he therefore had to choose someone to fill such high position after him. Abu Bakr was also the one who was honored to be chosen by the Prophet for such a task. Abu Bakr then asked people to choose between 'Umar ibn al-Khattab and Abu 'Ubaydah ibn al-Jarrah. Hearing this, both men jumped to their feet and exclaimed "O Siddiq, how can that be? How can anyone else fill this position as long as you are among us? You are the top man amongst he Muhajirun. You were the Companion of the Prophet in the Thawr cave. You led prayers in his place, during his last illness. Prayer is the foremost thing in Islam. With all these qualifications you are the fittest person to be the successor of the Holy Prophet. Hold out your hand that we may pledge loyalty to you." In the next day, Abu Bakr addressed the gathering of Muslims in the Prophet's mosque urging them to continue their path as true Muslims and to give him loyalty and support as long as he is obeying the Commands of Allah and His Messenger. He was followed by Umar, Uthman ibn Affan and then Ali. These four are called the Rashidun caliphs which means The Righteous Caliphs. The word caliph means religious and spiritual leader. Under these caliphs Islam became one of the most important religions of the middle East. Administrative offices of the Muslim nation were established. Under Umar more then two thirds of the Eastern Roman Empire was conquered by the Muslims. Umar also started the Muslim calender. The first civil war in Islam, also known as the First Fitna broke out in Islam during the rule of the fourth caliph Ali and lasted throughout his caliphate. The third caliph Uthman ibn Affan had been murdered by rebel Muslim groups who had political motives. After Ali took over, the most important problem he faced was that of punishing those responsible for murder. However many people felt that before accepting the position of the caliph, Ali should have focussed his attention on finding and punishing the murderers. A group of people led by Muhammad's wife Aisha, her brothers in law Talhah and Zubair ibn al-Awam refused to recognize Ali's caliphate. They instead raised an army which met Ali's army at Basra in Iraq, originally for the purposes of negotiations. In the night, some fighting broke out, probably out of confusion or due to rebel groups who were involved in the infamous murder. This led to the Battle of Bassorah (also known as Battle of the Camel) in which Ali's party emerged victorious. Aisha was escorted back to Medina honorably after the battle by Ali. This battle however did not entirely finish the tension in the Muslim empire. Ali was soon challenged by Muawiyah, the governor of the Muslim provinces of Syria. He too raised the issue of punishing Uthman's murderers and refused to acknowledge Ali as caliph until the issue had been solved. Muawiyah was a kinsman of Uthman and his army pledged to bring to justice the murderers and those who sheltered them. People who are sheltering the murderers was a reference to Ali and his followers. Accordingly, the two groups met and fought a battle, called the Battle of Siffin. This battle ended in a draw and so both groups decided on arbitration which also didn't lead to any concrete decision. Another group of Muslims, The Kharijites who had previously been with Ali, meanwhile rejected him because they felt that he was not following true Islam and conducting business over the caliphate as if it were his own property. In the following years Ali's governors could not prevent his losing provinces to Muawiyah who increased his strength by further expanding his army. Ali had shifted the capital of the caliphate from Medina to Kufa in 656. He was killed by a Kharijite assassin in 661. This page was last edited on 8 September 2017, at 19:33.